Heel and Toe MINI SKEINS!! perfectly with your Stripes and Speckles Skein! They will be either a semi-solid color, OR a speckled skein. OR $36.00 a month if you choose to pay on a monthly basis. This is totally optional- if knitting contrasting heels and toes isn't your thing- no worries! WE HAVE SEVERAL BASE OPTIONS!! you would like your club selection to be dyed in! You can choose 'Dyer's Choice', and let us pick your base for you!! 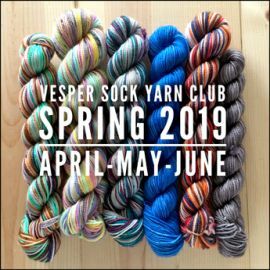 The price for the FULL THREE MONTH subscription is $90.00, ($108.00 wIth our NEW Mini Skein Option) shipping is included. Should you choose to pay monthly, you will be emailed the link to begin your payments. 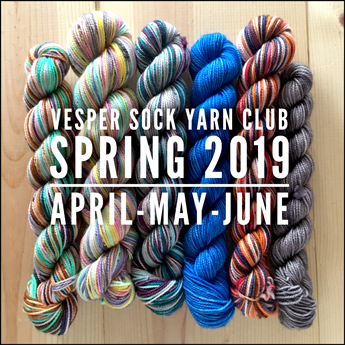 Club Yarn will be shipped towards the end of each month. Once a month for 3 months you will receive a skein of yarn suitable for knitting a pair of socks. Sock Club Base * -- Please Select -- 80/20 Superwash Merino 2ply NEW!! 75/25 Superwash Merino/Nylon Base 100% Superwash Merino Base 'Glitterful' SPARKLE Base! Dyer's Choice!